Please RSVP to authenticity.symposium@gmail.com by Friday, January 27 at 5:00pm. Attendees who have RSVP-ed will receive priority for lunch. 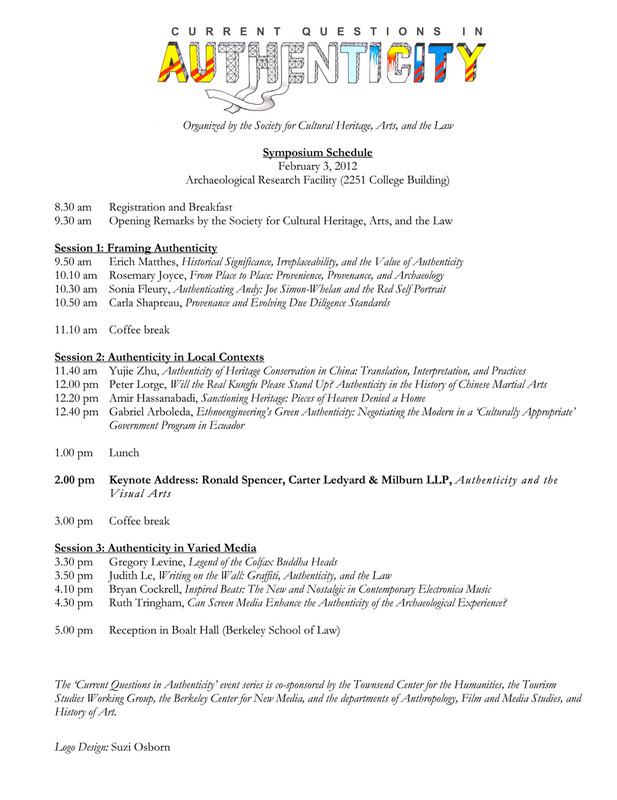 The conference will explore 'authenticity' from varied perspectives, including art authenticiation, contemporary music, philosophy, provenance, and sustainable development. The event will consist of 12 presentations throughout the day by students and professors from UC Berkeley as well as other universities. In addition, Ronald Spencer, an attorney with Carter Ledyard & Milburn, whose expertise is in cases involving the authentication of art works and who is based in New York, will be the keynote speaker. Click here or below to download the full schedule as a .pdf file. authenticity in such realms as food and music. For further information, please see the SCHAL website. You can also add yourself to our symposium Facebook page. This event is organized by the Society for Cultural Heritage, Arts, and Law (SCHAL), and is co-sponsored by the Tourism Studies Working Group, The Townsend Center for the Humanities, the Berkeley Center for New Media, and the Departments of Anthropology, Film and Media Studies, and History of Art.